JAKARTA, Indonesia -- Indonesian authorities say they have evacuated most tourists from Mount Barujari on Lombok island after it spewed a massive column of ash into the atmosphere. 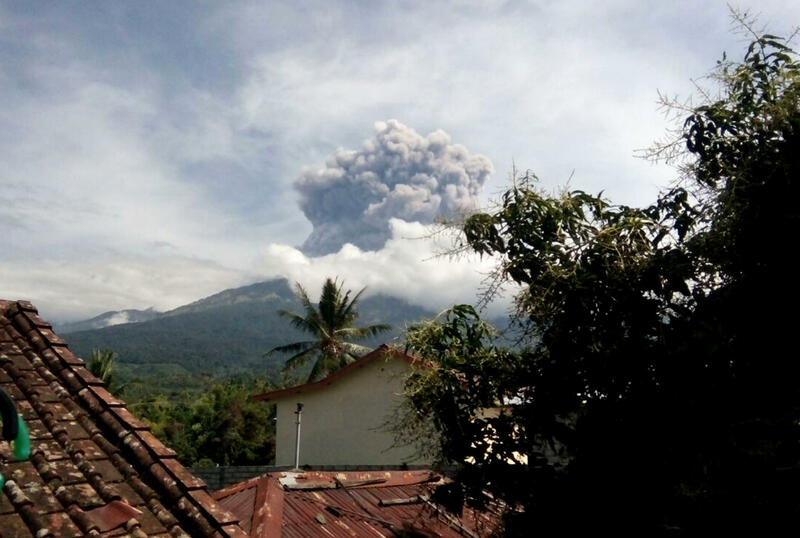 The volcano, a popular attraction that is known as the Child of Rinjani because it sits within the Mount Rinjani caldera, erupted without warning on Tuesday afternoon, delaying flights from the international airport on nearby Bali. The ash column reached 6,560 feet. Heronimus Guru, deputy operations chief at Indonesia’s Search and Rescue Agency, said Wednesday that the remaining tourists, about 50 people who are mostly foreigners, were heading down the mountain. Disaster Mitigation Agency spokesman Sutopo Purwo Nugroho said more than 1,100 tourists left the Mount Rinjani area on Tuesday. A similar number left Wednesday. There have been no reports of injuries from the eruption. Nugroho said government scientists have declared a danger zone of 1.6 miles around the crater and raised the volcano’s alert to the third highest level, but some tourists did not immediately heed warnings to leave because they wanted to take photos or videos of the eruption. The eruption interrupted flights for several hours at Ngurah Rai International Airport in Bali, airport officials said. Farms and trees around the 12,224-foot-high volcano were coated in a thin layer of gray ash, but nearby towns and villages were not in danger, Nugroho said.